It's only just begun, but chances are you are already sick of hearing about the Republican National Convention. The weeklong event is already getting almost non-stop coverage on CNN, and is taking news personalities like Samantha Bee and Stephen Colbert out of their usual stations. 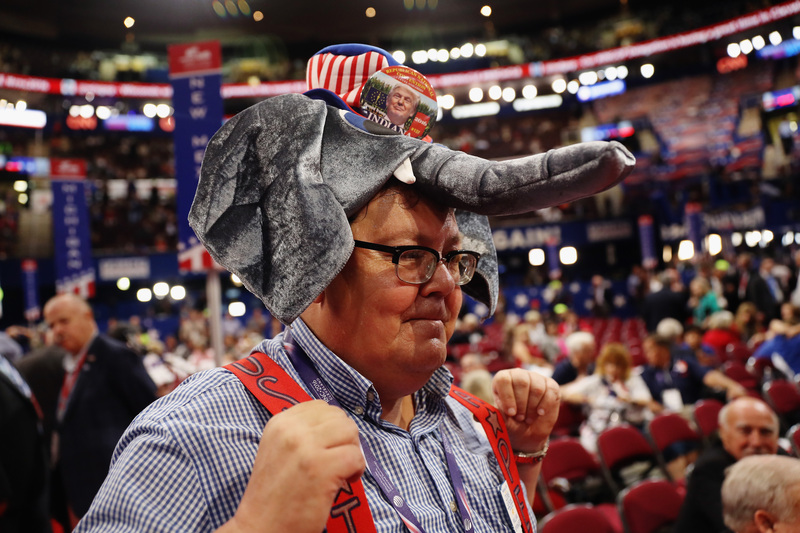 Although antics like Bee's Herman Cain bus and Colbert's Hunger Games tribute were a welcome breath of fresh air, America might be bored already with the RNC. But have no fear — it's a bored nation that has Twitter to post RNC memes and tweets. Amid anti-Trump protests and anger over potential open carry regulations around the convention, the the lineup of speakers has left many puzzled and Googling "star of Superbabies: Baby Geniuses 2" and "obscure '90s male model." The "themes" of the convention days read like Mad Libs, and it just seems hard to get excited for the chaos of this convention. That's what Twitter is for. As you scroll through the events and try to keep your eyes open during yet another speech that proclaims we can "take our country back," remember that Twitter is there for you. We are in this together. And in order to make this convention funny again, let's look at some of the most amusing Twitter posts so far. If you are experiencing some FOMO, plenty of people at the RNC are here to open your eyes to just how much the convention hurts the wallet. Six dollars for a hot dog? Oh I think not. Still not digging the RNC? Try following along with your own Bingo board. You might not win anything, but at least putting an "X" in the box will distract you from the lack of diversity at the convention. Maybe, just maybe, you need to see someone have too good of a time at the convention. Or maybe you would prefer to imagine a different political ticket. Whatever you need to get through the Republican National Convention, chances are Twitter has the cure to what ails you. If nothing else, you can take comfort in the fact that you are not watching the show alone.